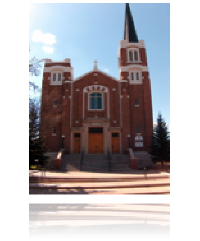 The Father Lawless Council # 1534 is affiliated with the St Joseph's Church, Moose Jaw, Saskatchewan. The Grand Knight for 2018-2019 is David Corry. Third Monday of the Month at 7:00 P.M. in the Knight of Columbus Chambers 1102 3rd St N.W. Moose Jaw, Sask. The Knights of Columbus is the largest men’s and family organization in the world, numbering close to 2 million members. The Knights were founded in 1882 in New Haven Connecticut by Father Michael J, McGivney to provide support for families in need within their communities. This very basic principal of the Knights of Columbus continues on to this very day. This movement spread quickly westward through United States and Canada and spreading worldwide. Council #1534 is affiliated with Saint Joseph's Roman Catholic parish. It was chartered on January 2nd 1911 and was the 4th council in Saskatchewan. In the mid 1970’s a request was approved by Supreme for the council to be named Father Francis Lawless. Fr. Lawless was a Redemptorist priest who was the pastor of St. Joseph parish from 1968 – 1975. He suddenly died of a heart attack during his tenure as pastor. Our council will celebrate its centennial in 2011 by hosting the State Board convention that year along with other events. © Copyright 1999 - 2002 by Knights of Columbus. All Rights Reserved. Last updated 17 Dec 2012. Send comments or questions to the web page editor, Council # 1534.